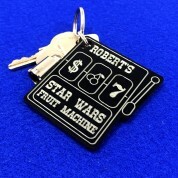 Customised Engraved Fruit Machine Keyring. Puggy Key Holder. Having a Fruit Machine in your gamesroom is cool and more than one is even better ... until you see how many keys come with each of them! Of course you could get a cheap keyring and a biro to write down the use of the keys ..... or you could keep them on a super cool personalised puggy keyring. 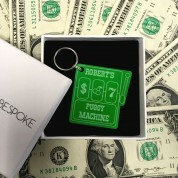 Gift boxed to create a great first impression and Laser Engraved with the recipient's name as well as an option to name the machine! 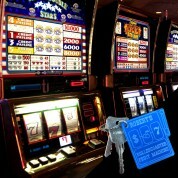 The fun doesn't stop there, we even offer a choice of six colours - after all how are you going to know which keys go with which slot machine at a glance! 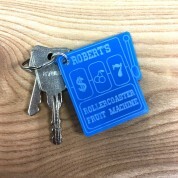 More than just a great Father's Day or Birthday Gift for his Games Room, these Key Holders are also extremely practical as well as fun so if you own or know someone who owns a pub or club with fruit machines then they are sure to thank you for such a cool but practical gift. 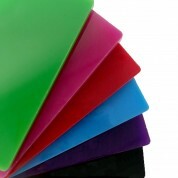 How to Personalise: Your Keyring will come in the "One Arm Bandit" design and the colour you select. We can add up to three lines of text (max 12 characters for name and 15 for lines 2 and 3) to include the recipients name as well as the name of the machine or other text of your choice - see images for guidelines.